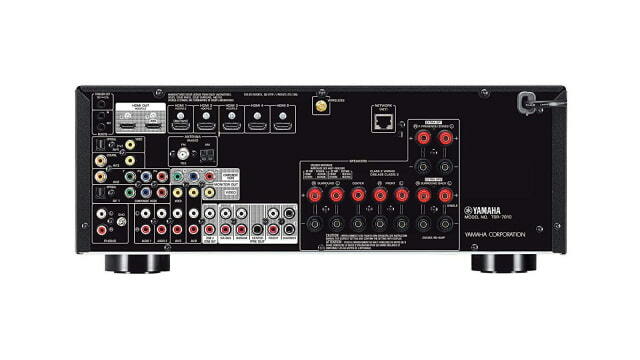 You can purchase a refurbished Yamaha TSR-7810 7.2 ch 4K Atmos DTS Receiver with Apple AirPlay support for 34% off today as Amazon's Deal of the Day. This 7.2-channel 4K Ultra HD network AV receiver features Dolby Atmos and DTS:X object based surround sound. The free MusicCast Controller app makes it easy to access your music library and streaming music services. Add audio in up to 9 additional rooms with MusicCast wireless speakers or other MusicCast devices. Wi-Fi, Bluetooth and AirPlay wireless connectivity, a phono input for vinyl playback, and Dual HDMI (Zone B) and Zone 2 audio provide added system versatility. ● MusicCast with Alexa Support: Access all of your music with a simple app and wirelessly stream it throughout your home using your existing Wi-Fi network. Amazon Alexa-enabled devices — including Echo, Dot, Tap and Show — can now control key functions of any MusicCast product using voice commands. Discover a new, exciting way to control music and entertainment experiences in your home. ● 4K, HDR, BT.2020, and 3D Support: Darker blacks, whiter whites and more vivid colors. This unit supports the latest HDMI standards thanks to the transmission of 4K video at 60 frames per second (pass-through only). Fully enjoy the HD video quality of 4K without loss along with HDCP 2.2 (fully compliant with latest copyright protection). It also supports the wider color gamut of BT.2020 pass-through. This AV receiver supports 3D video. Additionally, the Audio Return Channel function enables audio to be sent and received via the same HDMI cable, so you can hear the sound via a single HDMI cable. Another benefit of HDMI is the availability of CEC functionality. When the unit is connected to a CEC compatible TV, it will turn on and off together with the TV and you can use the TV remote to control the volume. CEC also provides advanced functionality with other components. For example, you can use the AV receiver remote to control player functions like skip and stop. *All connected devices must be HDMI CEC compatible. ● Virtual Presence Speaker and Virtual Surround Back Speaker: Wide, high and dense sound. CINEMA DSP 3D provides a wide, high and dense sound field. HD Audio format decoding lets you enjoy HD Audio sources. Virtual Presence Speaker delivers three-dimensional sound without the actual use of presence speakers. Virtually surround yourself. With the power of CINEMA DSP 3D, the Virtual Presence Speaker function makes full use of center and surround speakers to create audible information from where presence (height) speakers are normally installed. In addition, this model also features a Virtual Surround Back Speaker function. Even without using surround back speakers, you can experience more natural, lifelike sound from behind you without physical speakers being installed in the surround back area of the listening environment. ● Wi-Fi and Networking: Access more. This AV receiver provides a variety of network functions that enable you to access more sources and also enhance operation. You can connect the AV receiver to your home network or internet to enjoy Internet radio, Spotify, Pandora, Rhapsody, SiriusXM Internet Radio or music stored on a NAS and home PC. The AV Controller App (from iTunes or Google Play) lets you control various functions from your iPod, iPhone, iPad or Android phones/tablets. Built-in Wi-Fi allows for a connection with your wireless router, greatly simplifying system connections for enjoying networked audio (PC/NAS) and music streaming services. If a Wi-Fi router is not available, the unique Wireless Direct feature not only allows you to stream music directly from your smartphone or tablet via the AV Controller App, AirPlay etc., but also allows for control of the AV receiver as well. AirPlay and Spotify natively supported! ● YPAO - R.S.C. with Multipoint Measurement: Advanced sound optimization. YPAO - Reflected Sound Control analyzes room acoustics and measures various speaker characteristics, then calibrates audio parameters to achieve optimum sound in the listening area. It employs Reflected Sound Control to correct early reflections for studio-quality sound. It also provides DSP Effect Normalization which varies the CINEMA DSP parameters according to the reflected sounds. With multipoint measurement, measure up to eight locations ensuring each seat is acoustically optimized during playback. Hear everything low. Human ears have less sensitivity to high and low frequencies, especially at lower volumes. YPAO Volume applies loudness EQ correction to automatically adjust high and low frequency levels as volume changes. Using the YPAO measurement results, EQ correction is optimized to your system settings and listening environment. The receiver has a list price of $499 but you can get it for $329.99 today.